I am not a gambling man. But if I were, I’d bet a million dollars that you will never ever grasp all that Microsoft Excel has to offer. Fine with me because that means we can learn something new just about every day. 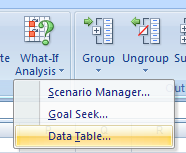 Pivot Tables provide a perfect example. The journey between just learning about Pivot Tables and being able to effectively implement and use them is indeed a short one. But take just a few more steps and you’ll find additional ways to save time, while adding helpful details to your information and analysis. Let’s say, for example your company keeps records for each sales transaction. A simplified table might include the name of the salesperson along with the date and amount of the transaction. The business world is full of “what-if”s. What if one of your suppliers raises its prices significantly? What if your boss demands that you spend at least 20% of your advertising dollars on sports programming? What if the corporate office suddenly shrinks your overall budget by 25%? With scarce resources, companies (and individual consumers, as well) are always looking for ways to get the most bang for their buck. Making matters more complex and difficult to navigate, often times decisions involve careful manipulation of several equally (or almost equally) important levers. For example, you want to minimize your costs, but the cheapest vendor is not as effective or dependent as the more expensive ones. And even if you had one clear choice, you never want to put all of your eggs in one basket, depending too heavily on one supplier. Or maybe you’re asked to minimize your costs on marketing and advertising, but must reach a minimum number of potential customers. One way to solve these types of problems is to build a spreadsheet, linking all of the important variables and calculations. You could then give the user (you or someone else) the option to change those variables, viewing the results of different scenarios as changes are made. The problems with this method should be obvious. Not only is it tedious, requiring the user to manually change the numbers in order to see what happens, but it is also incomplete. Insofar as these problems involve more than a few moving parts, it’s nearly impossible to manually account for and analyze every conceivable combination or possibility.